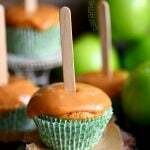 There is no better way to usher in fall than with these delicious Caramel Apple Cupcakes. Moist cupcakes loaded with apples and applesauce for double the apple flavor. A decadent caramel frosting tops them off beautifully. Popsicle sticks not optional. Line a muffin tin with parchment baking liners and set aside. In a large bowl, whisk together the eggs, brown sugar, and granulated sugar until smooth. Whisk in the applesauce and vanilla extract. In a separate bowl, whisk together the flour, baking powder, cinnamon, and salt. Stir the flour mixture into the wet mixture until combined. Stir in the shredded apples. Evenly divide the batter between the 12 cups. Bake for 25 to 30 minutes or until an inserted toothpick comes out clean. Transfer cupcakes to a cooling rack and let cool completely. Unwrap caramels and place in a microwave safe bowl. Microwave at 50% power for 1 minutes. Stir. Repeat int 30 second intervals until caramels are melted and smooth. Spoon frosting onto the top of cooled cupcakes and spread. You want a nice thick layer. If the caramel starts to thicken, microwave for another 30 seconds at 50% power, stir, and spread on cupcakes.